Faversham Swimming Club was established in 1965 as a seasonal club at a time when the town had only an outdoor pool. Junior Water polo. This is a growing section of the club and recently three junior players were selected to represent their region in tournaments. Water polo is enjoying a raised profile nationally and is fast becoming a very popular sport. We welcome new polo members, they will be subject to a swimming assessment. Faversham pools now benefits from both indoor and outdoor pools within one complex. The Club operates year round and provides activities covering a wide range of disciplines within the sport of swimming. Over 300 members from age 5 to 85 benefit from the Club. Please check notice board in the foyer of Faversham pools for exact times and details. Monday and Wednesday evening 6.30pm - 9.30pm or visit our website at www.favershamswimmingclub.org. The club continues to go from strength to strength embracing the learn to swim sections, competitive squad, synchro, awards and the new sections; Masters on Thursday evenings is growing steadily in numbers weekly and the active polo sections are proving very popular with the welcome addition of junior polo. For more information please come and see us at the club on Monday or Wednesday evenings or email us. Tadpoles (Beginners) - Children from age 5 upwards learn basic skills and water confidence under the guidance of experienced instructors and can work to achieve badges and awards. Improvers - Children develop stroke techniques and build stamina and can gain more advanced awards Wednesday evenings. Improvers are also welcome to be part of Junior polo, this is included in their membership fees. Squadron - Full training given to committed swimmers in all strokes, turns and starts with a view to entering competitive galas and events at District, County and Regional level. Monday, Wednesday and Thursday evenings and Saturday mornings. The squad are also invited to partcipate in Water polo, this is all part of their membership fee. If you think you might be interested please come along for a free trial on a Sunday evening for Junior polo, or Tuesday for Adult polo. Masters - Adult lane swimming with a training programme. An ideal way to train, keep fit in a quiet, peaceful environment with like-minded adults. Thursday 9pm -10pm. 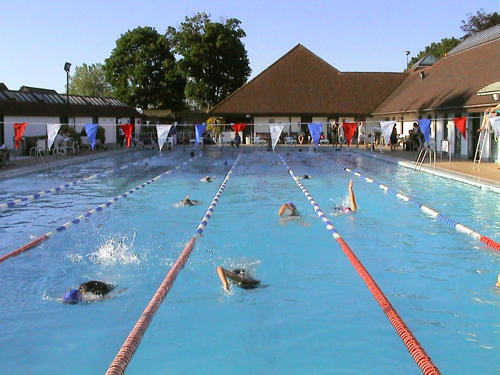 and in the summer we have three lanes in outdoor pool on Tuesdays 7pm to 7.45pm. Competitive Squad - For our committed swimmers who have reached a competitive level, training sessions are held 3 - 4 times each week and there are opportunities to take part in competitive galas and events at District level. Junior Water polo - in the summer, junior polo training is held in the outdoor pool on a Tuesday evening. Water Polo - For ages 16 and over, a chance to play a high energy water sport. For further information about the swimming pools, please visit the Faversham Swimming Pools page.